The second annual #BrunchWeek is almost over! I am so excited to have Susan of The Girl In The Little Red Kitchen as my co-host this year! Join us while we celebrate the deliciousness of brunch and to prepare for Mother’s Day and summer brunching season. We have 32 bloggers bringing you their best brunch recipes, from cocktails to eggs benedict to donuts; there is something for everything this week. Earlier this week I posted a Frozen Peach Bellini, Carrot Cake Baked Oatmeal, Orange Marmalade Pound Cake, Sausage, Pepper and Caramelized Onion Quiche and Lemon Blueberry Parfaits. As #BrunchWeek comes to a close, I am still in awe of how one little idea last year came to be such a great event. I was having brunch with my best friend, MC, and thought “wouldn’t it be fun to blog about brunch for a whole week”. 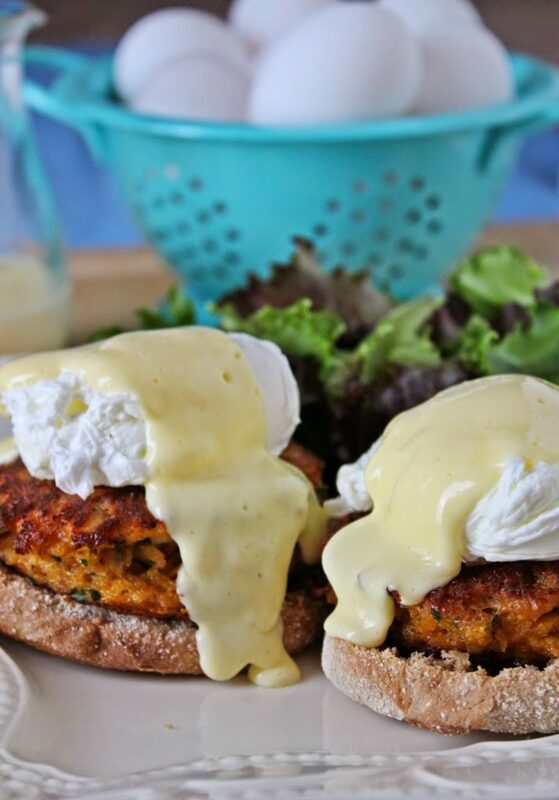 The Crab Cake Eggs Benedict is definitely a meaningful dish and one worthy of any brunch. I first had it with MC and fell in love with the flavors. This is a very appropriate dish for Mother’s Day because it is inspired from both of my grandmothers. One of my grandmothers gave me my love for hollandaise and taught me how to poach eggs. My other grandmother made the best salmon cakes and I tried to do her justice with my crab cake. Brunch, to me, is a time for family and friends to gather, celebrate and eat together. You can gather for a specific reason or just because. To celebrate an occasion, like Mother’s Day or Christmas, or celebrate just being together. To share good food with good company. I am so grateful to be able to share all this with you. I hope you have a chance to look at all the amazing recipes from the Food Bloggers this week. They are a tremendous group of individuals and I am glad to share a virtual Brunch with them. Happy Brunching! – In a mixing bowl, whisk together the Old Bay, Mustard, Mayonnaise, Lemon Juice, Worcestershire and Parsley. – Using a fork, lightly mix in the Crab Meat. – Add in the Panko Breadcrumbs and mix lightly with fork. – Heat the Olive Oil and Butter in a skillet on medium. – Portion the crab mixture into 4 patties. Cook about 4-6 minutes per side, then place on a paper towel to drain off any excess oil. Sprinkle Salt on the crab cakes if desired. You can keep them in a warm oven for a short period of time while preparing the rest of the dish. – Crack eggs individually into small bowls. – Using a spoon, swirl the water to create a cyclone effect. Slowly pour the eggs in the pot – best if done in 2 batches. Put the lid on, and take off the heat. – While the eggs are poaching, make the Hollandaise. – In a medium cup that fits the head of an immersion blender, add in the Egg Yolk, Water, Lemon Juice and a pinch of Salt. – Melt Butter in a small skillet on the stove. Once melted, pour into a heat resistant measuring cup. – Turn on the immersion blender and mix the Yolk. – In a slow, constant stream, pour in the hot Butter while continuously blending the Yolk. The easiest way is to pour down the side of the cup you are using. – Spoon warm Hollandaise over the top and Enjoy! Go here to see all the amazing prizes up for grabs during #Brunchweek! California Walnuts, Bob’s Red Mill, Oxo, Dixie Crystals, Whole Foods Market Doctor Phillips, Grimmway Farms, Woot Froot, Vidalia Onion, Baloian Farms, Stemilt and Bonne Maman are providing the prizes free of charge. I have received product from the sponsors to use for #Brunchweek. All opinions stated are my own. Now this is an exquisite way to end Brunch Week!!! 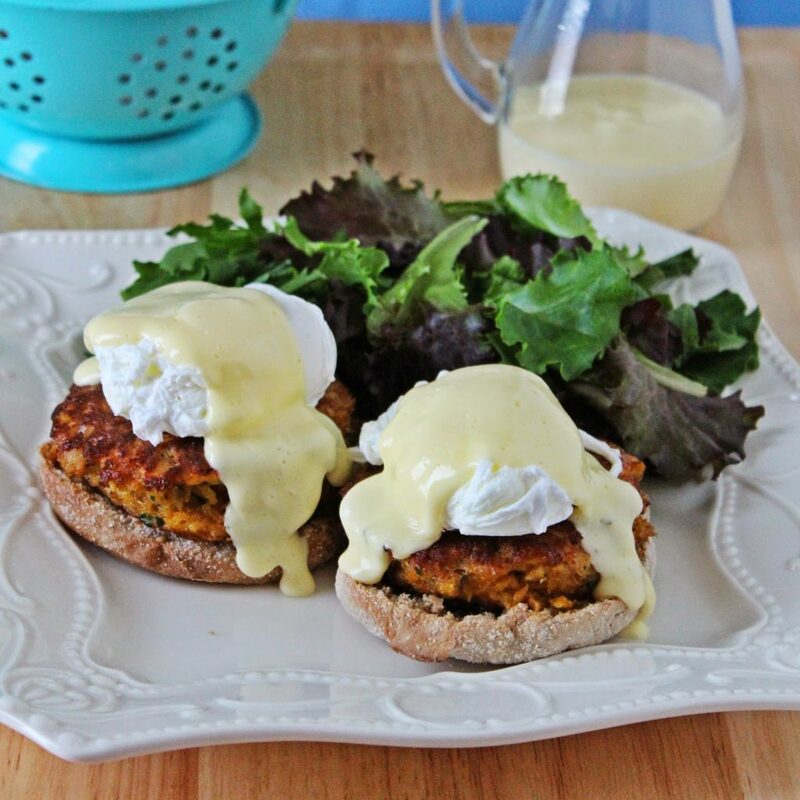 Love your twist on eggs Benedict! THANK YOU and Susan for all your hard to in organizing this week!!! This is such a creative way to reinvent eggs benedict! How elegant! This is motivating me to attempt poached eggs once and for all, since they seems so refined and delicious-looking. 🙂 As a matter of fact, I have some egg yolks to use up, so this is a great opportunity! Living in the Pacific NW we do have our crab. I love crab cakes. I have had them as a bennie a few times, but I forget about it when I am going to make bennies. How could I???? Too many recipes, too little time and too few calories to spare. Anyway I can vouch this is a wonderful idea. And I will tag this so I will remember. I am new to your blog, so congrats on your sweet baby girl. Keep us posted as she continues to learn new 'tricks'. 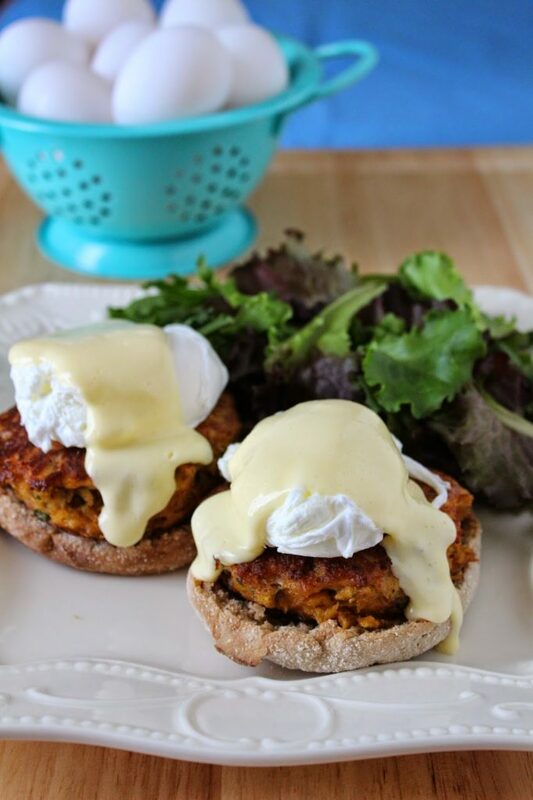 I love crab cakes and I think that it is an amazing idea for a brunch. Oh gosh! That recipe looks so delicious. 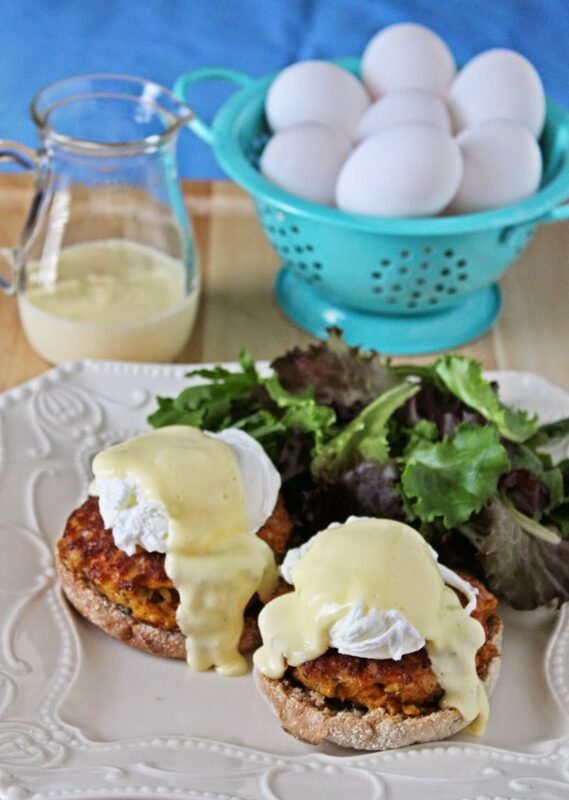 I love crab cakes and mixing them up with the classic eggs benedict makes them even more appealing. My stomach is really rumbling right now, just by looking at the pictures. Anyway, thank you so much for sharing the recipe. I'll definitely try that out. All the best to you!